Taste-Test Kitchen baker Anita Reeck demonstrated this recipe – one that she developed – on the Wisconsin Journal program airing on WEAU-TV Channel 13, Eau Claire. The segment was broadcast Jan. 19, 2008, and repeated Jan. 20, 2008. Preheat oven to 375 degrees F. In a medium skillet, brown the sausage, onion and garlic. Remove from heat, drain fat and add dried cranberries. Stir and set aside. Spray bottom of a 9 or 10 inch deep pie pan with non-stick cooking spray. Roll out 1 sheet of puff pastry to fit inside pan, pressing pastry dough up the sides of the pan. Sprinkle the shredded Monterey Jack cheese over puff pastry. Spread the sausage and dried cranberry mixture on top of the cheese. Next sprinkle the broccoli on top of the sausage mixture. 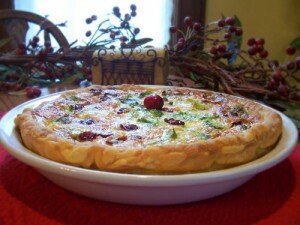 In a medium bowl, combine the eggs, half and half, salt, and pepper; whisk to combine and then pour into the pie pan. Top with Swiss cheese. Bake for 40 to 50 minutes or until a knife inserted near the center comes out clean. Let stand 10 minutes before cutting. If desired, garnish with fresh parsley and cranberries. This entry was posted on Tuesday, March 2nd, 2010 at 10:17 pm	and is filed under Recipes. You can follow any responses to this entry through the RSS 2.0 feed. Both comments and pings are currently closed.